How does the new version of the browser shape up? Newsfeed headers appear inside a scrollable drop-down list. It's a very close call, but Firefox 2 has retained its crown because it delivers all the good stuff and there's very little to gripe about. Granted, Opera can do some things that Firefox can't, such as torrenting and email, but Firefox doesn't set out to be a jack of all trades so we won't hold this against it. Firefox has been on the scene for two years now, but despite being infinitely superior to the only real competition, IE6, incredibly it constitutes only about 10 per cent of the browser market. It's a sleek yet highly customisable interface, and everything's in the right place. Bizarrely there's no New Tab button by default (we're expected to use the keyboard shortcut perhaps?) but it's easy to add one. 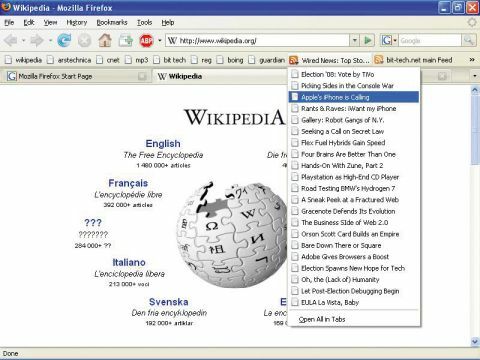 In common with IE7 and unlike Opera, Firefox does have a Bookmark bar that holds buttons for your most frequently used Web pages, which we think is a splendid feature. Firefox has a rather different but nonetheless perfectly workable take on the organisation of newsfeeds. Instead of appearing in a side panel or email-style presentation, feed headers appear inside a scrollable drop-down list. You can choose where the list sits - it can go inside your Bookmarks menu, or it can fall from a button on the toolbar. Either way, it fits the header list inside a compact piece of Window furniture, but this of course means that there's no search function or category filters. We were quite amused by the potentially disastrous 'Open all in tabs' option, which really does attempt to open each post in its own tab. Yes, all 20 of them. Firefox doesn't have Opera's highly useful Trash Can button, but the same effect can be achieved by using the Recently Closed Tabs option from within the menus or by pressing [Shift] [Ctrl] [T]. Unlike the other browsers, Firefox has an inline spell checker that spots bloopers in your Web mail and underlines them just like a word processor. That's a really handy one if you usually type in Word and then paste the text into your browser. Firefox has a built-in ad-blocker, but you often have to click the things that you want to block. Adblockers should work without any user intervention, so this wasn't very impressive, but there's an ad-blocking add-on that does the trick. There's no mouse gesturing in Firefox 2 by default, but luckily there is an add-on to remedy this. The phishing filter of Firefox 2 works by checking URLs against a list of known bad sites. The list is updated regularly, but this of course does not constitute realtime protection. There is an option to use Google's real-time phishing protection service, which involves sending some information about the sites you visit to Google. Of course, all real-time phishing filters have to receive information about your URLs in order to check them, so if you're not happy with the privacy implications of this then it's not a service that you should use. Our only niggles about Firefox 2 are that there's no tab preview function and fewer options for displaying your Browsing History. The real strength of Firefox 2 is that it has all the features of its rivals combined. It's true that add-ons are required for mouse gestures and ad-blocking, but installation of these is a quick task so we can't complain. It trumps Internet Explorer 7 by having more features, and trumps Opera by being more widely supported by Web sites.